Trash To Couture: Indian Choli sewn convertible skirt. Indian Choli sewn convertible skirt. I got this in the Halloween section of a thrift store. It was 50% off so I got it for basically nothing. The beading was amazing along with the vibrant colors...I made pockets with the sleeves so I didn't have to cut the beaded work. Sewed the back up with a zipper and wah la! 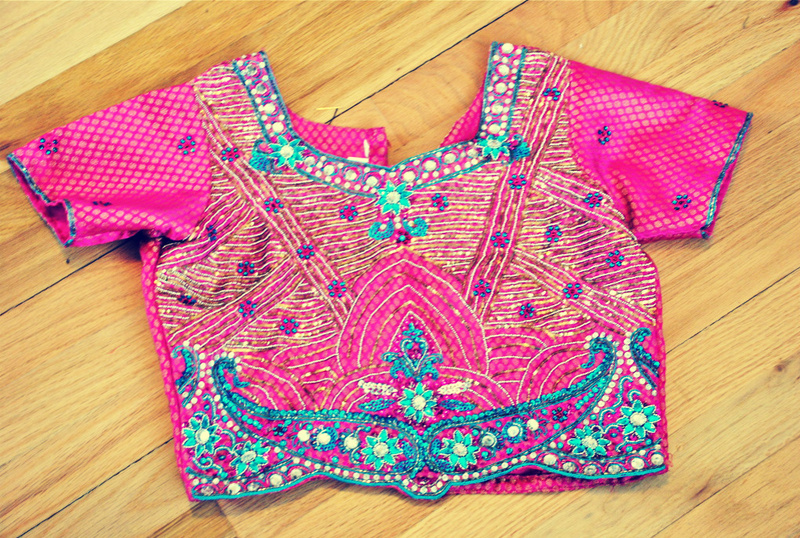 Before it was a lovely Indian Choli...I didn't take my scissors to it so I can still wear it as a cropped blouse. When thrifting I always look for unique fabrics like this! That is fantastic! You're so talented!! thanks for the info...I love it either way. I didn't take my scissors to it so I can still wear it as the cropped blouse. It is traditional Indian blouse..also called called as choli..usually worn with equally elaborate and rich and heavy flowy skirt all the way to your feet..also called as lehenga..
To westernize it..it can be worn as a crop top with flared denims. But this is an unexpected awesome twist. great idea! I didn't take my scissors to it so I can still wear it as a cropped blouse :). I like the idea with jeans!! how beautiful. never would've thought of this! Can we see a back view? That's so cute!!! I never would've thought of that! WOW! Amazing piece, great freakin' job! Awesome Kristine, Thank you so much! 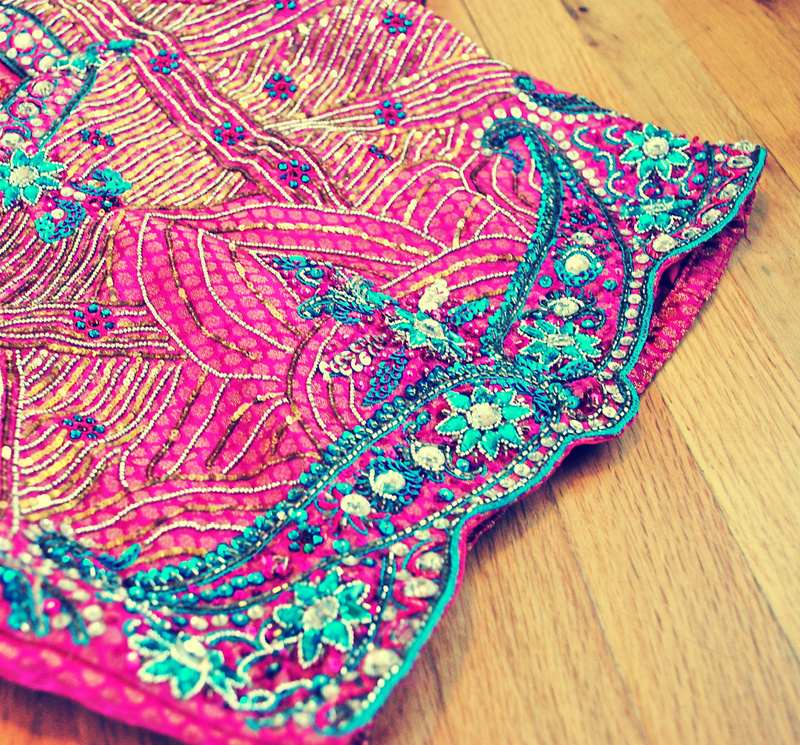 How did you cut out your pattern without ruining the beading? "voila" is the word you're looking for here, I think. I LOVE this idea! Any way you could do a more step by step tutorial of it?? You are unreal!! I have been sitting here in my kids' room, trying to get my youngest munchkin down for nap, and have read through a ton of your tutorials... I welcome any afternoon where he fights sleep and I have to sit with him with your blog open on my laptop! Awesome renovations of sweet thrift store finds. I don't know how you make the time to create such rad stuff. I sew also, and am constantly turning my clothes and too-little tanks/tees into aprons and skirts for my daughter (when I get a sec to do it!) but I want to try every one of your designs so I can keep some of my cast-off clothes for ME! Awesome. You're my fave. Oh so beautiful! I always looked at these intricate things in thrift stores and I couldn't think up a way to use them, now I know! Definitely on my to-do-it-yourself list and I must put it on my blog, too! With a link to your site of course! I keep coming back to this all the time ,so super cute ,remember if you ever decide to sell it ,let me know . Please post a step by step tutorial on how to make this!! Can you please post a step by step tutorial on how to do this!! I like the style. Good diy project.